Walter Brindley and Mary Badger were married 22 January 1845 in Gnosall, Staffordshire,England. Walter was the son of Robert Brindley and Ann [possibly Haynes] of Gnosall born c. 1812. Brindley is a very common name in that part of England. There is no known connection with James Brindley, the famous bridge-builder. For detailed information about Robert and Ann Brindley’s family and more information about Walter, see: http://genforum.genealogy.com/brindley/messages/114.html According to R. Williams’ information on the previously mentioned forum, Walter and Mary had the following children in England: Mary A. Brindley b c1844, Rachel Brindley b c1845, Robert J. Brindley c 1 Jan 1846 Bradley, Mary Brindley c 28 Apr 1847 Bradley, Sarah Myra Brindley c 28 Apr 1847 Bradley, Susan Brindley c 30 Jul 1848 Bradley, Arthur R. Brindley c 16 Jun 1850 Bradley, Harriet Maria Brindley c 18 Jun 1853 Bradley. Two more children were born in England, George Joseph and Walter. 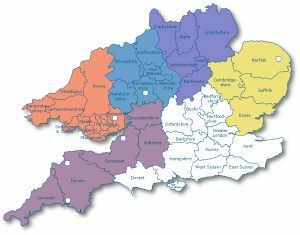 In 1851, Walter Brindley Sr. and his father Robert Brindley were tenant farmers at Upper and Lower Wollaston (322 acres and 288 acres respectively) in Bradley, Staffordshire, England on land owned by James Ashton (Directory of Staffordshire). 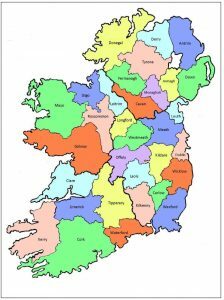 The family moved to Ireland before 1861 where they lived at Summer Hill House, Roscrea, at the intersection of Kings’ [now Offaly], Queens’ [now Laois or Leix] and Tipperary Counties. However, Walter Brindley must have returned to England occasionally as he is listed in the 1861 English census as “visitor”, “farmer in Ireland”, at the farm of Richard Edwards, Parish of Diddlebury, Township of Lower Parks and Broncroft. George Badger, farm bailiff, is listed on the neighbouring farm. He may be Mary Badger’s brother. At least two more children were born in Ireland: Thomas Alfred and Patrick (or Bertrand). Mary died of premature labour and flooding (in childbirth) on March 2, 1868, at Gorteen, age 45. Of the five girls, only Mary Ann married (see Hewitt page). It is unknown what happened to the Brindley daughters other than Mary Ann who became responsible for the care of the younger ones after her mother’s death. Her younger siblings described her as the mainstay of the family. 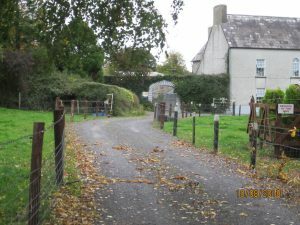 The farm in Ireland has been variously described as “one of those 90-acre specials” or ” 1000 acres – so big it took a man a day to walk around it”. 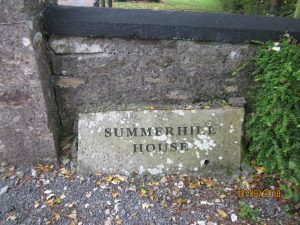 It was called Summer Hill House and located at Gorraun Gurteen, about five miles from Roscrea. The above photos were taken on a visit to Ireland in October of 2018. The house was substantial and had a number of stone walls around it. A back section (not shown) had large windows with decorative bricks around them. Walter Brindley might have been a land agent or a bailiff. In the 1870s his name appeared as “complainant” in a number of civil cases on topic such as trespassing and money for work owed. Walter Brindley is listed in an Irish document on Roscrea under “Nobility, Gentry and Clergy” and also under “Farmer” [a more suitable category]. The owner of the land that he was living on, and working for, was Henry White. According to Marguerite Brindley Young, who was the daughter of the younger Walter Brindley, Summer Hill House was shaped like a T with a rookery at the bottom. Walter Brindley Sr. enjoyed inviting his friends out from England to go fox-hunting, but when rent time came, he had all his boys out borrowing to pay the rent (Young, 1982). Three Brindley daughters, Rachel, Sarah and Lucy were members of the Methodist Church of Ireland in 1875 and Arthur was a member in 1877. Only their father Walter was listed in 1880, and by 1890 the Brindley name had disappeared from the church record. Walter Brindley died July 13, 1882, age 68, at Knockfinn, Durrow, Abbeyleix, Laois from heart disease and dropsy. The informant of his death was his son-in-law Benjamin Hewitt, listed as “occupier”, so it would appear that Walter was living with Mary Ann and Benjamin. Ben and Mary Ann and six of their children left Ireland in 1892 (see Hewitt page). The claim of being Irish is not very strong. In 1872 Mary Ann’s brother Robert John Brindley married Eleanor Jane Jackson, the daughter of their neighbour Francis Jackson of Killavilla House. 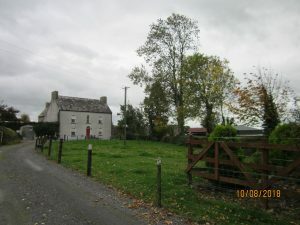 Robert raised horses at Longford [Ireland]. In 1885 Robert and Eleanor Jane moved to Chebogue, Nova Scotia with their family, which eventually numbered 15 children. In Canada Robert was a ship’s provisioner and farmer. He married 3 times and was buried in Wayne, Maine (Greendale, 1983). George Joseph, Thomas Alfred and Arthur Richmond went to South Africa in about 1882. Walter Brindley followed his brothers to South Africa, as did Walter Thomas Brindley Hewitt, the eldest son of Benjamin Hewitt and Mary Anne Brindley Hewitt. After 17 years in South Africa, Walter Brindley (the younger) went to England to find a wife, Annie Badger, and then on to Nova Scotia to visit his brother Robert. Next Walter went to Alberta and proved up a homestead at NE 23-56-24-W4 near his sister Mary Ann. After a few years he and his family (children Chuck and Marguerite) moved to California. Walter was present at Mary Ann’s funeral in June of 1902 and recalled it as “a rainy day and a very sad one” (Young, 1986). George Joseph and his wife Minnie Elizabeth Tooth were early pioneers in the Johannesburg area. In the Boer War, George joined the Johannesburg Mounted Rifles. After the war, he farmed at Standerton, Orange Free State, calling his farm Summer Hill. Thomas Alfred fought with Bethune’s Mounted Infantry in the Boer War. After the war Thomas, his wife Marian Salomons and their family lived in Wakkerstroom, Transvaal, where they ran the Eclipse, later the White Rose Bakery. Rachel, Sarah, Susan and Lucy Brindley did not marry. One report says that Rachel and Lucy followed their brothers to South Africa and Susan and Sarah stayed in Ireland to care for their father. Another report has Lucy, Rachel and the youngest son Bertram (or Albert) emigrating to Mexico (Tapping, 1986). Walter Thomas Brindley Hewitt came to Canada once, for his sister Edith’s wedding to John Milligan in 1902. The Edmonton Bulletin reported the following on October 4, 1901: “W.T. B. Hewitt and G. J. Brindley, from South Africa, arrived Tuesday, on a visit to relatives in the district. Messrs. Hewitt and Brindley resided in South Africa before the war broke out and passed through some very exciting incidents when hostilities were declared. They left Tuesday morning for New Lunnon where they will visit with Mr. and Mrs. Hewitt, and may possibly take up land”(p. 01). Walter Hewitt had gone through the siege of Ladysmith, which was also written up in the Edmonton Bulletin in April of 1900: “The writer considered himself lucky in having secured a Dutchman’s pillow, the value of which he appreciated thoroughly after resting his head nightly for months on bags, coats or stones,whichever happened to be most convenient.” (April 27, p. 6). Walter Hewitt died in 1917 from pneumonia, caught while riding in an open carriage on the veld in South Africa. Please note that personal letters written to Hilda Milligan in the 1980s as well as some research by a South African genealogist have been referenced on this page.